Third graders listened to Thanksgiving Day Thanks by Laura Elliott this week and enjoyed coming up with things they were thankful for just as Sam did in the story. 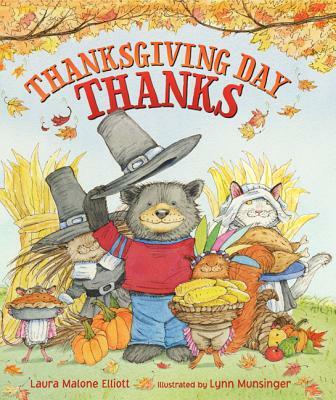 This is a charming little book that also gives great information about Thanksgiving, including facts about the first Thanksgiving and interesting tidbits of information about thanksgiving foods and customs. Did you know that a ripe cranberry will bounce? Kindergarten–Kindergarteners enjoyed The Great Gracie Chase by Cynthia Rylant. This is a perfect book to use with the Visible Thinking Routine, Here Comes Trouble. Students noticed in the book when the plot problem started and gave ideas about how it might be solved. The format of this book and the fantastic illustrations by Mark Teague make it a wonderful read aloud for this age group. First Grade–For a little pre-Thanksgiving fun, first graders heard Turkey Suprise by Peggy Archer. Two pilgrims boys start out to find a turkey for their Thanksgiving dinner and even with the turkey’s less than successful escape attempts, they decided to opt for pumpkin pie instead. A cute story for the holiday!